Barolo is the Grand Italian Wine by definition, also produced entirely with Nebbiolo grapes. The appellation “Barolo” comes from the village in the Langa Region bearing the same name a few kilometres south of Alba, in Northwest Italy. It is now made in eleven ‘communes’ or village territories, all situated on the scenic Langa hills shaped by centuries of vine cultivation and recently . The other communes included in the Barolo production area are: La Morra, Monforte, Serralunga d’Alba, Castiglione Falletto, Novello, Grinzane Cavour. Verduno, Diano d’Alba, Cherasco and Roddi. These communes, unlike Barolo, are only permitted to cultivate Nebbiolo for Barolo on a part of their territory. Fontanafredda is located in Serralunga d’Alba, at the Eastern extremity of the Barolo production area. The municipality of Serralunga d’Alba is a long and narrow ridge or sierra (from which the Serralunga name derives) of about 7 km length (4.35 miles) and less than 2 km (1.24 miles) width, stretching from North to South. Serralunga d’Alba has always been one of the most important territories of the denomination of origin, both because of the very good quality of many vineyards and of the solid, austere and inimitable style of its Nebbiolos. The lands of the Serralunga d’Alba hills are of miocenic-helvetian origin. The subsoil is rich of limestone and of grey marls alternated with layers of sand. This alternation of sands and calcareous marls allows producing wines of excellent fineness, structure and elegance. The micro-climate is continental cold temperate, with warm summers and rigid winters and with strong temperature leaps between day and night during the ripening period, which allows the grapes to intensify a series of particularly fine and intense aromas. The vineyards of Serralunga d’Alba originate many of the greatest and renowned selections of Barolo, names that are known to the connoisseurs: Barolo wines, characterized by alcoholic strength and great structure, that are full and robust, capable of withstanding particularly well the adversities of time. Thus it was not a foregone conclusion that, when Barolo was above all an assembly wine, the grapes from Serralunga would be the most sought-after by the big cellars of the area for increasing the structure of their own wines and that today, thanks to the quality consolidation by many producers (some of these younger, others with a long tradition), the fame of the Barolo wines produced in this municipality would be continually expanding. Made with 100% Nebbiolo grapes, Barolo is born in the heart of the Langhe, just a few kilometres from the town of Alba and, more precisely, within the territory of eleven municipalities which extend through a beautiful itinerary of gently-rolling hills, moulded by man’s expert hand and made even more beautiful by the presence of splendid medieval castles, recognised in 2014 as World Heritage by UNESCO. Our estate and many other historical estates in the area, traditionally make Barolo with grapes grown in different vineyards, each with their own particular characteristics and nuances. Located at the eastern tip of the Barolo production zone, the municipality of Serralunga d’Alba has always been considered one of the supporting areas of the appellation, due both to the excellent quality of its numerous vineyards and the inimitable style of its Barolo: wines with a rigorous and refined style, and with excellent structure, capable of coping brilliantly with adverse weather conditions. It’s no mere coincidence that when Barolo was largely a blended wine, the grapes grown in Serralunga were those most sought after by the area’s most important winemakers to enhance the structure of their wines and that, nowadays, the fame of the Barolo made in this municipality is growing constantly. Each of the eleven municipalities included within the Barolo Appellation has “subzones” with unique and peculiar characteristics. The initials MGA (Menzione Geografica Aggiuntiva, meaning Additional Geographic Mention) indicate a specific production area that has been officially delimited and encoded (essentially equivalent to the French term “Cru”) within the entire Barolo production zone. The Fontanfredda MGA covers a total of 58 hectares, including the approximately 15 hectares of contiguous vineyards cultivated with Nebbiolo for Barolo which surround our cellars as a single plot of land. Within the entire Barolo appellation, Fontanafredda is the only MGA that is named after an Estate/Winery – due to its historical prestige – as well as being the largest and most ancient. 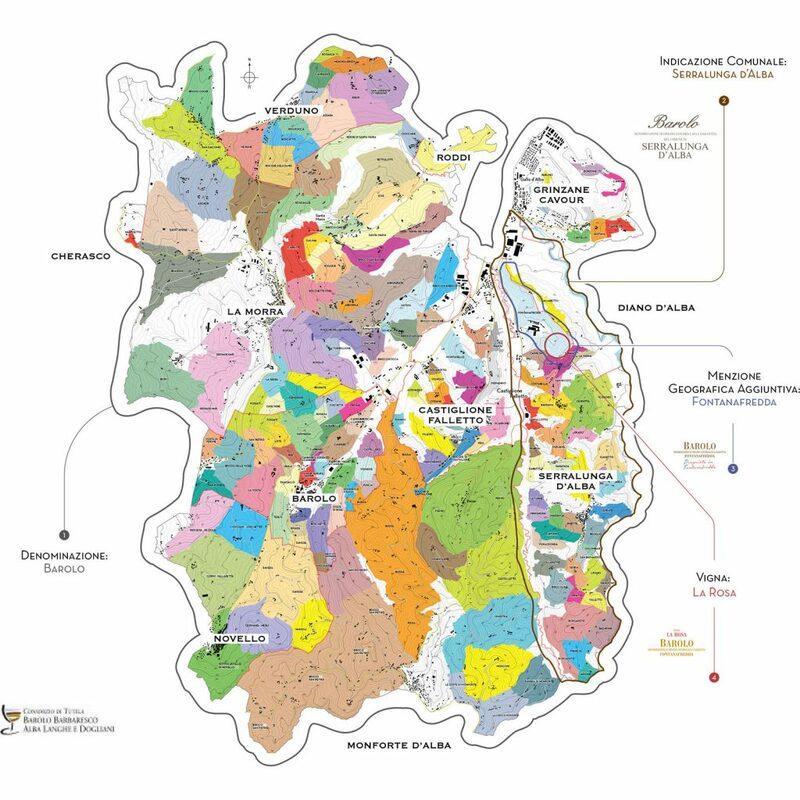 Within each MGA, different vineyards can be identified and mentioned with the term “Vigna” followed by the relative name place or traditional name, provided that the single vineyard is always indicated in unison with its relative additional geografic mention (MGA). Right in the heart of the MGA Fontanafredda, we find Vigna La Rosa, one of Serralunga’s most famous vineyards: almost five hectares cultivated entirely with Nebbiolo, exposed to the south and south-west. The soil is of Miocene-Langhian origin, rich in calcareous marl and clay, but with plenty of quartz sand, which guarantees good drainage and conveys an undeniably floral character to the Barolo, along with very fine and graceful tannins and a level of acidity that is always well sustained.